Page Type Name - The readable name of the page type. Page Type Handle - The system handle. only lowercase letters, numbers, and underscores. Default Page Template - The page template that will be used by default when this a page of this page type is created. Launch in Composer? - Determines whether or not the composer overlay launches automatically when a page of this page type is created. Useful if you have lots of attributes or options that need to be set right off the bat. Is This Page Type Used Frequently? - Checking this box makes the page type always appear in the Pages panel. Otherwise it will be tucked away under the "more" section. Allowed Page Templates - Allows you to choose which Page Templates can be used in conjunction with this Page Type. Publish Method - Let's you control the publishing flow, e.g. whether users can publish it under any page, below a certain page only, or below pages of a certain page type. 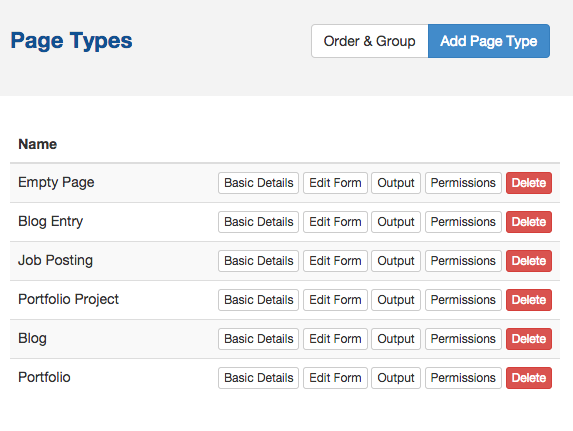 Edit Form - This allows you to control what attributes are available to edit for the page in composer. Output - Allows you to see which Page Templates are associated with the Page Type and edit their default content. Permissions - Let's you edit permissions pertaining to this page type: Edit Page Type, Edit Page Type Permissions, and Edit Page Type Drafts. And if need be, you can delete them.